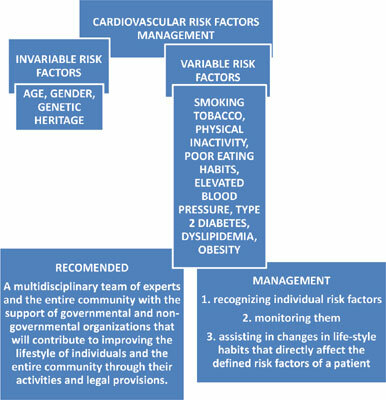 Aim: To summarize the main findings on variable cardiovascular risk factors and their management in everyday practice. Methods: A narrative review of the relevant literature known to the authors and incorporation of healthy changes tips in defined variable cardiovascular risk factors. Results: There are known variable cardiovascular risk factors to be claimed as those that should be changed in order to achieve a better prevention of cardiovascular disease development. But, most papers are informative and they didn’t incorporate exact measures for each variable risk factor. Our paper shows exact measures for each variable cardiovascular risk factor that should be incorporate in everyday practice of family practitioners and cardiologists as well. Conclusion: The best cardiovascular disease’ prevention should include a multidisciplinary team of experts and the entire community with the support of governmental and non-governmental organizations that will contribute to improving the lifestyle of individuals and the entire community through their activities and legal provisions. The most important factors in cardiovascular disease management are: recognizing individual risk factors, monitoring them, and assisting in changes in life-style habits that directly affect the defined risk factors of a patient. The simplest and most practicable guidelines for CV prevention in accordance with the national, cultural and socioeconomic aspects of their country of work are needed. Mortality and morbidity, Cardiovascular Diseases (CVDs), dyslipidemia, obesity, smoking, sedentary lifestyle, arterial hypertension, diabetes mellitus.